I have another HOME RUN to report! Used your ‘one to many’ template to a “T” and sold 40 CPAs (out of a room of 125 primaries) a $1,997 product on Saturday in Nashville, with a 75 minute presentation! This is better than DRUGS!! If you “speak to sell” either in-person or online, (or want to add this skillset to your marketing arsenal) and would like to exponentially increase your sales, and have your prospects clamoring to buy what you’re selling, then this will be the most important book you’ll ever read. So put your phone on airplane mode and lock your door so you won’t be disturbed... because what you’re about to discover is that important, that revolutionary, and could change your business life forever. FACT: For over a decade, the strategies exposed in my new book “Sales Stampede” have worked like magic, not only for me but for a select group of entrepreneurs I’ve revealed them to already - including lawyers, financial advisors, speakers, dentists, chiropractors, coaches, consultants, and information marketers. “I just got back from an event last week where I sold over $330,000 in one hour using Dave’s system!" Or take Linda Sherfey, an estate-planning attorney. After studying my process and embracing the principles laid out in this book, she went from getting 20 to 25% of attendees at her workshops to schedule an appointment… to seeing a full 75% of the room make a frantic bee-line practically begging to do business with her. That’s an increase of 300%. Imagine what a similar increase in results could do for you. How would that transform your business? I can’t guarantee that the secrets in my book will produce those kinds of results for you and your business. Heck, I don’t know you, what you sell, or if you’ll embrace and use the techniques and strategies you’ll discover in my book. So promising that you’ll get life-changing results would be unethical. I’m saying this right from the get-go because I respect you too much as a fellow entrepreneur to hype-up my book just to get you to buy it. It works for everyone else I’ve taught it to. – because “Sales Stampede” lays out everything you need to know to achieve dramatic, even explosive sales growth. Indeed, you could consider it your all-in-one guide to one-to-many sales success. ~ Dan Kennedy, author of 24 books on marketing and sales. Imagine having the ability to sell massive amounts of your products or services every time you step on stage or before any group of prospects. Imagine what it would be like to generate huge paydays for your business practically on demand, wherever and whenever you want. Imagine creating a mad rush of excited customers who want to buy or make an appointment to meet with you – enabling you to help more people than ever before. Imagine the satisfaction and security of knowing, without doubt, that at any time you have the very real potential to make more sales or book more appointments in a single day than you currently do from a year’s worth of presentations. Listen, if you already “get on stage and speak,” whether in-person or via media, or you want to, you are a special person. Studies show that the fear of public speaking tops the charts above all over anxieties humans face. Greater even than death! I respect you for putting yourself out there in a way that most business people would never dare and I want to help you get the most impactful results you can from every presentation you do. Because when you fail to deliver a presentation that converts at the highest level possible, you’re not only doing yourself a disservice, you’re also doing your prospects a disservice because they’ll walk away without taking action. Meaning they can’t experience the benefits your product or service will give them. 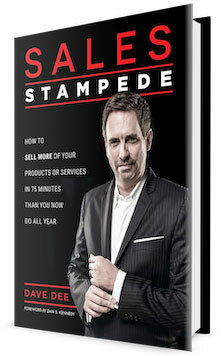 “Sales Stampede” will be a game-changer for you, regardless of what you’re selling or who you’re selling to. It rewrites the rules of the game – changing your positioning from just another person pitching their product or service to a highly respected Expert Advisor. You won’t struggle wondering what to say when you make a presentation to sell – you’ll know exactly what to say and how to say it for maximum bottom-line results. This book hands you on a silver platter a precise, easy to use step-by-step SYSTEM for doing group-sales presentations that will double, triple, even quadruple your conversions. The investment for the book is just $10. As soon as you place your order, you’ll receive an email receipt and my team will mail a physical copy to you. If this book is as valuable as you claim, why is it so inexpensive? First, I have a passion for helping entrepreneurs make more money and live the life of their dreams. It’s my mission and why I chose the business I did. Second, by delivering over-the-top value in this $10 book, I know that you’ll want to continue to do business with me in the future. That’s why it’s only ten bucks. I’ve spent more than 3 decades as a professional speaker. I’ve presented on stages in more than 50 countries to millions of people worldwide. ~ Brian Tracy, best-selling author, personal development guru, speaker. I won’t give you some tired old song and dance about “limited time only deal” or a false-scarcity play here. I plan to sell it for a very long time. So it’s NOT going to disappear from the web and if we run out of copies, my publisher will happily print more. If you’re not getting the sales numbers you know you deserve, then you need this book. If you’re not seeing the kind of closing percentages you honestly believe you should be getting, then you need this book. THEN – You NEED this book. So the scarcity isn’t on my end. It’s on yours. It’s what you’re facing every day right now. Why then would you wait any longer? During this training, I’ll share with how to apply the principles of one-to-many selling in the book to all different types of sales scenarios including email marketing, video sales letters, and regular sales letters, and more. This bonus training takes what you’ll learn in the book to a whole new level that will increase your sales and profits. And it’s absolutely free when you check out my new book. I guarantee that this book and advanced training video will blow you away. In fact, I’m so convinced of it that if it doesn’t, I’ll refund your $10 and you STILL get to keep the book. Nope, you don’t even need to send the book back. Just let me know via email at dave@davedee.com and I’ll refund your $10, no questions asked. So there’s no reason NOT to move forward and claim your copy of “Sales Stampede” now. Click the button below and discover the thrill of seeing an almost instantaneous increase in your profits by finally mastering the art of one-to-many selling. I can’t wait to hear of the newfound success you experience! ​I ran a webinar last week on my own, then, put his techniques in place, and did the webinar again. The second time, with a smaller audience, I had double the sales! I cannot tell you how rewarding it is to go through a course and get these kind of results. From storytelling, to how to give a better close to telling the audience exactly what you want them to do in order to get them take action, Dave's teachings were spot-on. I just wish I had learned his system years ago. Don’t delay. Click the button below and grab your copy of “Sales Stampede” now.